American Communities Trust (ACT) is excited to announce a partnership that will kick off the redevelopment of a blighted 3.5-acre site and create jobs for residents of East Baltimore. ACT, a Baltimore-based national community development organization, has awarded a contract to Details, a social enterprise of Humanim, to begin deconstructing some of the non-historic structures on the future site of the Baltimore Food Hub located in the Broadway East neighborhood of East Baltimore. 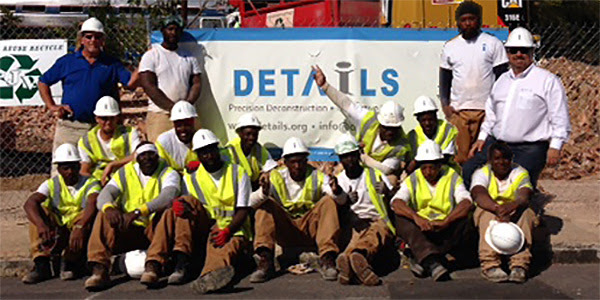 Details is a fast-growing, nonprofit deconstruction business with a social mission to create jobs for people with barriers to employment. Deconstruction is a greener alternative to traditional demolition because workers take apart buildings and salvage the materials for resale, reuse or repurposing. Deconstruction creates up to 6-8 times more jobs than traditional demolition. This work marks the first step toward launching the Baltimore Food Hub, a $20 million initiative to develop a campus of food-industry facilities and enterprises that will create approximately 141 construction jobs and more than 100 permanent jobs over the next three years. A Details crew of 10 employees will be assigned to the Baltimore Food Hub project, which will take about a month to demolish the non-historic structures. All of the employees will be residents of East Baltimore. Three grand historic buildings on the site will not be demolished. Instead those buildings will be restored, thanks to a $3 million award of historic tax credits by the State of Maryland. The Baltimore Food Hub is a partnership between ACT, New Broadway East Community Association, Historic East Baltimore Community Action Coalition (HEBCAC), Humanim, and the City of Baltimore/Baltimore Development Corporation. The Baltimore Food Hub has funding and in-kind support committed by the U.S. Economic Development Administration, State of Maryland, Abell Foundation, Annie E. Casey Foundation, East Baltimore Development Inc., Goldseker Foundation, France-Merrick Foundation, Johns Hopkins University, Knott Foundation, and the Plank & Dicarlo Family Foundation. The project partners are grateful to all of these funders and supporters. For more information please visit baltimorefoodhub.com.